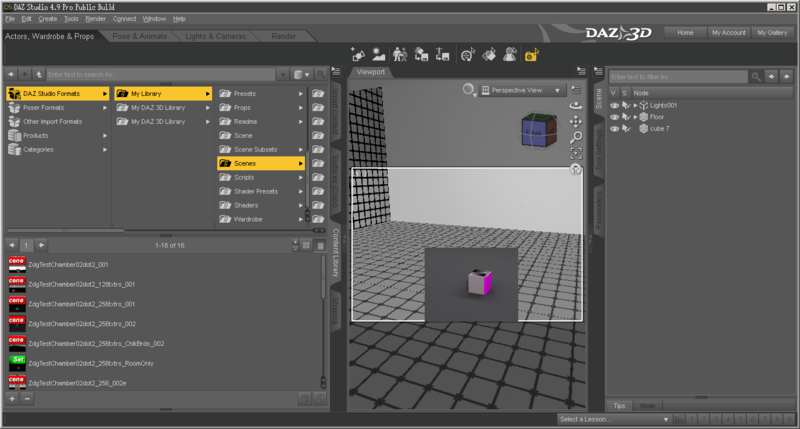 Daz 3D is pleased to announce Daz Studio Pro BETA - version 4.9.0.36! !! IT IS HIGHLY RECOMMENDED THAT YOU BACKUP YOUR CONTENT DATABASE IN DAZ STUDIO 4.8 BEFORE LAUNCHING DAZ STUDIO 4.9 !! Reseting the database in any version of Daz Studio that uses PostgreSQL (4.6 or later) will purge all of data in the database, including any data that may be used by earlier versions or other applications, such as Carrara. Fixes made to the implementation of Sub Surface Scattering (SSS) in the NVIDIA Iray renderer affect materials which have "Translucency Weight" active—not set to 0. This manifests in skin tones appearing more blue than they do in 4.8. A quick adjustment that can be made during the BETA phase is to adjust the "SSS Reflectance Tint" from a light blue to a light yellow—R: 1.00, G: 0.88, B: 0.67. Adjust this value to your liking. After the BETA phase, Daz 3D products will be updated to include this change. The Mac version now requires OS X 10.7 or later. Will the version in the Public Build channel replace the one in General Release? What is new in Daz Studio 4.9? Do I need to update my copy? Daz Studio 4.9 resolves many issues and implements many improvements since the 4.8.0.59 General Release. More detail on specific fixes/changes/improvements can be found in the Change Log, which can be viewed online within the Documentation Center portion of our site. All new downloads of the Daz Studio Pro BETA product (SKU: 12000) will be of this version. Right-click an asset you've created, or which was not installed with metadata, and choose "Explore User Assets..."
Context menu > "Explore Add-Ons..."
Context menu > "Explore Targets..."
View products in your account that are "available via Daz Connect"
Context menu > "Install Update"
Context menu > "More Information..."
Context menu > "Explore Product..."
While enabled, filtering occurs based on what is selected [or not] in the scene, the content type assigned to a given asset, the category that is currently selected and the keyword(s) that are entered into the filter field. When disabled, filtering occurs based on the category that is currently selected and the keyword(s) that are entered into the filter field. When "Filter By Context" is enabled (see above), displays all assets/products—including those that are not associated with a category. When "Filter By Context" is disabled (see above), displays all assets/products that have metadata. Scenes that would cause crashes while rendering no longer do. See "Has the NVIDIA Iray renderer been updated?" for more in-depth information. Has the NVIDIA Iray renderer been updated? Anti-aliasing if the gauss filter is used has been improved. Wrong behavior of ground plane in combination with a set backplate background color has been fixed. Pattern issues with caustic sampler enabled have been fixed. A bug has been fixed where Bridge jobs referencing elements that don’t exist would still execute without error. Now the execution will fail with error code -4. A Bridge memory leak that occurred for Bridge clients on Linux only has been fixed. A small client side Bridge memory leak has been fixed. The priority of MDL expressions in the MDL exporter has been fixed. Rare crashes when array index expressions were used inside an MDL material have been fixed. Cases where an invalid MDL preset was created when exporting it have been fixed. parameter is not array typed. Array typed expression are now correctly handles when used inside a material preset. Tailored error number reporting during .mi import has been enabled. Each error now gets a speciﬁc error number assigned. Currently, only .mi syntax errors get reported with error number 4001, other .mi parser internal errors with 4002 and all others are defaulting to 4000. This will be extended in the future. As a performance optimization, MDL jit-compilation for simple color math is now avoided for Iray Photoreal and Iray Interactive. MDL parameters of array type are now properly exported including their dependencies. The MDL module name "<builtins>" will not be listed in the list of MDL includes. A bug in the export of parametric approximations has been ﬁxed. Convergence issues with the caustic sampler enabled have been ﬁxed. A memory corruption when running out of device memory while uploading scene data has been ﬁxed. Various issues have been ﬁxed that would show when disabling emissive geometry or moving emissive geometry around while other emissive geometry was disabled. The incorrect orientation swaps for MDL emission (with EDFs that have global "global distribution" set) in case the transform changes the handedness of the light source's object space has been ﬁxed. Picking in case "mip lens focus" is 0.0 and "mip lens radius" is not 0.0 has been ﬁxed. A client side memory leak when rendering using Iray Bridge and loading multiple scenes in succession has been ﬁxed. A threading issue has been ﬁxed where Iray Bridge could assign the same session ID to multiple sessions under certain circumstances. This could lead to weird errors if multiple sessions with the same ID were connected to the same Bridge server. A bug has been ﬁxed where sending very large frames, for instance high resolution PNG, would trigger a warning that the channel send buffer soft limit was exceeded. This had no negative impact and is part of normal operation so this warning has been removed. Wrong timing for the "canvas update" progress message when rendering with one of the cloud render modes has been ﬁxed. Now this progress message will be issued just after the frame has been written to the canvas. A problem occurred when the render termination criteria was reached for the cloud render modes. In this case the next call to render() would always return 1 (render criteria reached) even if the scene was changed. This has been ﬁxed. A bug, where the client log would warn about having to pause the video stream for 0.0 seconds because of video congestion, has been ﬁxed. Iray Bridge will now only warn if the congestion was long enough to affect the framerate noticeably. The MDL inliner got confused in some rare cases when the result of an inlined function was used as an argument to the same function, i.e. f(f(), g()) and f was inlined. This has been ﬁxed. Rendering a scene over Iray Bridge would occasionally fail with a missing operator*(color,ﬂoat). This has been ﬁxed. Reading of uniform int and resource parameters if the parameter was a uniform function call and not a literal when a MDL material was instantiated has been ﬁxed. Using the select operator inside the body of a MDL material would sometimes lead to a crash. This has been ﬁxed. The .cb importer now accepts the string option "cache override" which will override the cache location speciﬁed in the .cb ﬁle. The structure type name used in the method IQueue manager connection::submit job() has been renamed from "Name and pixel type" to "Canvas type" and the ﬁeld "output name" has been added. The ﬁelds in the structure type "Snapshot data" have been renamed from "name" and "ﬁle name" to "snapshot name" and "result name", respectively. See the documentation for details. Fixed at bug in light sampling using uninitialized memory if a MDL material has both front and backside explicitly set but only the front is emitting. Fixed handling of MDL 1.0 usage of spot edf(): The default value of the spread parameter is now π, not 2π as it was before. Fixed crashes when uniform functions are added to some uniform parameters of various ::base functions. Iray Bridge video will now fall back on using the software h264 encoder (if available) if the hardware encoder fails to encode, for instance because the resolution is too high. Previously, the software encoder fallback would only work if the hardware encoder was not loaded or failed to initialize because there were no suitable GPUs available. Iray Bridge Video hardware h264 decoding now requires an NVIDIA GPU with compute 2.0 or above (Fermi and newer). Proper GPU detection support for vGPUs has been added. vGPUs are now correctly handled by Iray's device detection which prior to this change ignored all GPUs of PCI bus type. Support for light emitting geometry to the material id and generated material id render target canvases has been added. The memory page in the HTTP admin server has been improved. All devices in the system are listed together with their status. Memory is listed in human-readable form. The output of the generated material id canvas has been changed to contain values that match the input data rather than synthesized data, leading to slightly more stable output in animations. However, note that users who require stable values should always use the material id canvas together with explicitly assigned material IDs. Support for per-object settings for shadow terminator compensation has been added. Glossy reﬂections on the virtual ground plane are now disabled in network rendering. Virtual ground plane shadows are not ﬁltered in network rendering. Support for texture resources with non-const gamma mode has been added. A bug has been ﬁxed that could block the Iray Bridge Server system thread for a long time during session shutdown if a scene contained a very large number of elements. This could cause a new connection attempt, while the previous session was cleaning up, to time out and fail. Rendering aborts on Iray Bridge Server that could occur non-deterministically when parameters of an MDL material were changed in some materials have been ﬁxed. The export of rectangle lights resulted in incorrect orientation of the light. This has been ﬁxed. An issue in the export of the approximate attribute on instances has been ﬁxed. Exporting parametric approximation settings now works for all supported types. Empty tonemapper settings (a tonemapper attribute without values) are no longer exported. An issue in the export of the approximate attribute for subdivision surfaces has been ﬁxed. The ground plane was visible from below if the inﬁnite dome mode and the respective ﬂag was set. This has been ﬁxed. The backside material's emission if the emitting light material was ﬂagged as two-sided has been ﬁxed. Crashes and unintended light source intensity changes when moving around light sources have been ﬁxed. Potential destruction order issues after rendering with renderer data on remote hosts is now avoided by following the behaviour of the master host in terms of unpinning. An issue with "progressive rendering samples" > 1 leading to different result images when "indirect lighting mode" was set to 1 or 2 has been ﬁxed. A bug causing visual artifacts in the environment dome when using section planes has been ﬁxed. A crash when using virtual ground shadows in network rendering has been ﬁxed. A crash when using virtual ground glossy reﬂections in network rendering has been ﬁxed. A bug in the MDL exporter has been ﬁxed that allowed to create ﬁles whose names were not a valid MDL identiﬁer. A bug in the MDL exporter has been ﬁxed that caused the copying of ﬁled-based resources to fail under certain conditions. The name of the ternary operator when used on the tex::gamma mode type has been ﬁxed. This ﬁxes possible render aborts because of missing operators. A new licensing scheme has been added. Most notably, without any license, neuray will not start anymore, while current licenses continue to work without any change. In Iray Bridge, per element logging when importing .cb ﬁles is now set to the highest verbosity. OptiX Prime has been updated to version 3.8.1. It primarily resolves hierarchy construction problems for some scenes. Due to the OptiX Prime update, Iray now requires a CUDA 7.0 compatible driver if using CUDA accelerated rendering. Iray now logs information about its identity, version, build date and platform at startup of the library. The shutdown of Iray when all hosts in a cluster stop at the same time has been sped up. Rendering speed when doing multi-hosted rendering with many hosts has been improved. It's now possible for a WebSocket client (e.g. 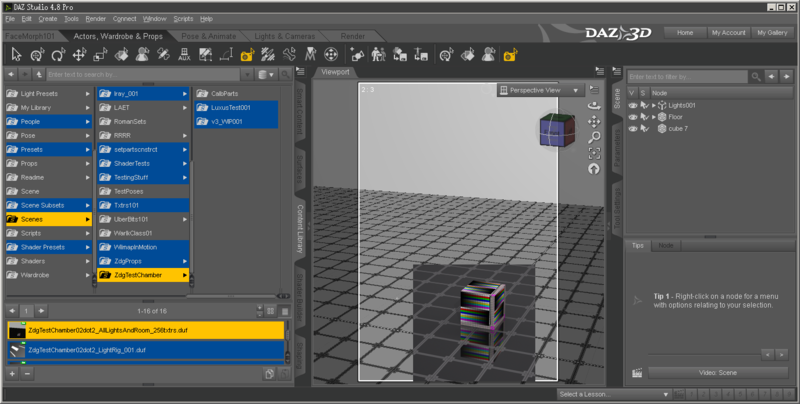 Iray Viewer) to connect to a WebSocket server (e.g. VCA or Bridge Server) via an HTTP proxy. To do this, IGeneral conﬁguration::set http proxy address can be called to specify the HTTP proxy address. If the HTTP proxy requires authentication, IGeneral conﬁg::set http proxy authentication should be called to set the username/password. Currently, basic and digest authentication schemes are supported. The Iray admin page now contains all CUDA devices in the system, not just the ones currently used for rendering. A new label indicates the status of the device. Support for exporting memory-based MDL modules has been added. The .mi exporter now triggers the export of memory-based MDL modules. A warning about 'select' elements has been added to the .mi importer. Whenever a 'select' scene element is found, the .mi importer warns that this type is no longer supported and ignores it. .mi language support for materials at scene elements of group type has been added. The .mi language has been enhanced such that an instance group, similar to instances, can have materials. This removes an incompatibility between the API and the .mi language, where the former supported that feature already. The performance for scenes with cutout has been improved. QMC sampling has been improved. It is now less prone to temporal artifacts and shows less patterns in difﬁcult scenes if the caustic sampler is used. matte shadow intensity has been added as a new attribute. It has the same effect as the already existing ground plane shadow darkening factor, but has been extended to work on all matte objects in general. shadow terminator offset has been added as a new attribute. It is a workaround for the classic shadow terminator problem on low tessellation geometry. Note that it is not recommended to always enable this, as it can lead to new artifacts in corners or if other geometry is nearby. iray shadow terminator offset has been added as an attribute in the scene options to globally disable the above attribute. The randomness of Worley noise mode 2 has been improved. The convergence rate for some difﬁcult lighting setups has been improved. Instance transform updates have been sped up. Instancing support has been added. Glossy reﬂections on the virtual ground plane have been added. Please note that the shadow buffer does not contain glossy reﬂections of shadow computations on the virtual ground plane. irt env lighting mode and irt env approx color to approximate direct environment lighting have been added. The convergence in all Iray Interactive modes has been improved. The iteration speed has been improved by 50% when using irt indirect light mode==2. Support for shadow terminator correction using iray shadow terminator offset has been added. The maximum ray depth has been increased from 16 to 64. JIT compilation for systems with several equal GPUs is now done per GPU class, not per GPU device anymore. The interface mi::neuraylib::IBackend to access the MDL JIT backend from the MDL SDK has been added. Users of the MDL SDK can now compile parts of MDL material instances into LL VM-IR or PTX code. The creation of MDL modules with forbidden module names will now be rejected. Such modules cannot be imported into MDL either. The MDL exporter has been signiﬁcantly improved. As a consequence, the export of MDL modules is no longer limited to presets, but is now also possible for MDL modules that were imported from ﬁle or via string. Resources in such modules are also handled correctly. A crash has been ﬁxed that was seen in some cases when doing multi-hosted rendering with many hosts. A crash in geometry attribute retrieval has been ﬁxed. When creating an empty mesh (i.e., no vertices) but creating a texture mesh attribute nevertheless, internal accesses of the mesh led to a crash. This has been ﬁxed. The compatibility of base::gradient3 with the Iray builtin has been ﬁxed. Wrong gamma conversion for RGB(A) textures reduced to a single channel via the average operator has been ﬁxed. Several memory leaks have been ﬁxed. A deadlock seen with a low cpu limit has been ﬁxed. Crashes in Iray Photoreal after a device runs out of memory has been ﬁxed. Matte shadows in scenes with both emitting geometry and ﬁnite light sources have been ﬁxed. A crash when rendering only alpha with the architectural sampler has been ﬁxed. Global illumination with multiple GPUs has been ﬁxed. A bug causing erroneous indirect lighting in irt indirect light mode==2 has been ﬁxed. A bug causing missing direct lighting from large area light sources in irt indirect light mode==2 has been ﬁxed. A bug causing light splotches to appear after a large number of iterations when using irt indirect light mode!=0 has been ﬁxed. A potential crash when all devices failed during scene setup has been ﬁxed. A potential crash in the disk cache when a very old database was updated has been ﬁxed. A rare crash when an MDL material used a user deﬁned function that accessed a non-existing texture but no other state function has been ﬁxed. The MDL compiler's thin-walled analysis has been ﬁxed. It reported different transmissions for front side and back side in some rare cases because 'no transmission' wasn't detected properly. The .mi export of ITriangle mesh has been updated. Due to the deprecation of per-point and per-vertex attributes on the triangle mesh, exporting a triangle mesh could have led to numerous warnings. The .mi exporter is now using a more general way of retrieving the attribute values. Note that the debug option "use rdma" has been removed in a previous release. There is an ofﬁcial option in the INetwork conﬁguration API component, now. Path handling of light proﬁles in .mi ﬁles has been ﬁxed. When trying to locate light proﬁles given with relative paths, the current working directory was sometimes not taken into account. A crash when updating decals has been ﬁxed. For instance, when updating a decal by removing and re-adding it in one step, the internal scene update sometimes kept two copies of it around, which ﬁnally could have led to a crash. The initialization order of internal libraries has been ﬁxed. Before starting neuray, some libraries were already started. This led to problems when trying to customize their behavior, e.g. providing a custom logging facility. Network rendering problems seen with some scenes with huge instance groups have been ﬁxed. Textured emission material changes on other objects' materials could lead to an invalid texture reference, causing the wrong texture to be used for emission or, in the worst case, a crash. This has been ﬁxed. If parts (but not all) of a MDL function were supported by builtin procedurals this could lead to undeﬁned results. This has been ﬁxed. An alpha issue for the caustic sampler has been ﬁxed. Potential CUDA out of memory problems if a render call and a ray tracing hierarchy build happen at the same time have been ﬁxed. Timeout handling has been improved. Sample data loss for the mega kernel in case of timeouts is now avoided. A bug causing cutout opacity to be ignored when the opacity wasn't deﬁned by a texture has been ﬁxed. A bug causing a crash when preprocessing environments on the GPU using a GeForce Titan X has been ﬁxed. Some indeterminism in the MDL serialization has been ﬁxed, which caused unnecessary data uploads to the VCA when rendering. Unused textures in JIT compiled code are no longer referenced. This ﬁxes a crash in rendering scenes after a texture in a material was changed in Iray Interactive. The handling of JITed materials has been ﬁxed: JIT compilation of MDL expressions that got compiled into zeros/random numbers under some conditions has been ﬁxed. The compilation of MDL material presets that do not override all parameter defaults has been ﬁxed. Previously, using such a preset could cause the VCA to abort the rendering (lost connection). The blend render mode now supports setting render context options for the preview and reﬁned render mode. The Queue Manager API to manage render jobs has been added for the future use with Iray Server. The Bridge API interface method IIray bridge server::delete snapshot(const char* snapshot path) has been added. This method can be called by the bridge server to remove a .cb scene snapshot ﬁle and release the corresponding cached data. The .mi importer now checks for invalid light settings during .mi import. When it ﬁnds a directional light with area settings, the area settings will now be ignored. A proper implementation for verbatim texture I/O in the .mi format has been added. All supported formats are now implemented. Verbatim textures of "vector texture" type are not supported by the .mi exporter anymore. For backwards compatibility, the .mi importer will still handle verbatim textures of that type which were incorrectly exported. The .mi export of instance/group approximation settings has been improved. This avoids creating .mi syntax errors when exporting instance/group approximation settings. The .mi exporter now handles stand-alone decal materials, i.e. those that are not in a material array. Prior to this, stand-alone decal materials were ignored during the .mi export. Access to per-point or per-vertex attributes from the triangle mesh itself has been deprecated. Using this deprecated feature will not result in a compile-time error, but generates a warning at runtime (since the methods are still used for per-primitive attributes). Please use the corresponding connectivity instead (as it is already done for polygon meshes and subdivision surfaces). A ﬂag has been added to INode manager client::join or create cluster which marks the cluster that is being created as 'reusable'. With a reusable cluster, the worker program may be shut down and a different worker program may be started. If worker reservations have to be unrolled for some reason, there's now a check for workers that may have dropped out of the netgroup in the meantime. Logging during cluster creation has been improved to make the decisions taken by the node manager more transparent. A new callback, IShutdown cluster callback, has been added that can be registered with IN-ode manager client. It will be called whenever a request to shutdown a cluster is received within the netgroup. The precision for all builtin noise functions has been improved, especially visible in bumps derived from noise. environment dome ground visible from below ﬂags the ground to be always opaque, default: on. dome ground legacy reflection reenables the now deprecated way of doing limited ground reﬂections (no reﬂection of the ground in other reﬂections), default: off. Emission in Iray Photoreal now respects the shading normal of the emitting object / light source. Emitting objects now have MDL programmability support for the material emission slot "intensity". The implementation of procedural bump maps has been improved for world and object space coordinates resulting in no more seams and higher performance. The robustness of nested volume rendering has been improved. Support for camera and/or light sources in volumes has been added. Iray Interactive has been sped up in cases where the jitted code of all scene materials has not changed. The convergence of environment sampling has been improved. Support of ﬁreﬂy ﬁltering parameters iray ﬁreﬂy ﬁlter and iray nominal luminance has been added. Glossy transmission has been implemented. The MDL compiler now supports inlining of function calls at material instantiation time. This reduces the need for JIT compilation in many places, especially inside the core deﬁnitions package. The MDL compiler does not inline material instances inside default parameters anymore. This allows better inspection of material parameter defaults because other material instances are still visible here. Calls of base::tangent space normal texture() and base::ﬁle texture() can now always be JIT compiled. The previous restrictions have been removed. The MDL core compiler detects C-style now and produces a meaningful error (they are now allowed in MDL). The MDL core compiler now issues an error if an extra type qualiﬁer is used on a MDL constant declaration. An attempt to remove a sub-scene containing the scene camera will not remove the scene camera anymore. Label update handling has been ﬁxed. Removing the label attribute went undetected by the scene update. This now gets properly handled and reported. A potential hang of the client in case a recruited worker is unexpectedly running a worker process during cluster startup has been ﬁxed. A potential crash in the membership callback for leaving hosts has been ﬁxed. Getting the value of an unknown cluster property has been ﬁxed. If cluster creation failed, the new cluster instance and reserved workers could be leaked in several cases. This has been addressed. A potential hang when joining the netgroup has been ﬁxed. A problem with shutting down and restarting a cluster, where the cluster could no longer be joined, has been ﬁxed. Worker node descriptor::get address no longer returns a port number with the address. An issue if both caustic sampler and object attributes that affect visibility were used has been ﬁxed. Sun & sky evaluation issues with large sun sizes have been ﬁxed. For bitmap textures in base.mdl, the modes base::mono luminance and base::mono average now respect gamma correctly. The parameter mono source of base::blend color layers is now supported correctly. Setting global distribution = false is no longer ignored for df::measured edf. Changes to the camera transform's x and z-scale were sometimes not recognized by Iray Photoreal, leading to "ghosting" with the previous camera. This has been ﬁxed. A potential crash with inﬁnite texture coordinates has been ﬁxed. is speciﬁed multiple times ([mat1, mat1, mat1, ...]) Iray Photoreal potentially tried to allocate huge amounts of memory. This has been ﬁxed. Wrong brightness of emitting objects with MDL light intensity mode "intensity mode power" in case multiple instances of the same object / material are present has been ﬁxed. A crash in the architectural sampler when rendering multiple alpha light path expressions has been ﬁxed. The iterations-per-frame reset on cancel has been removed. This caused the iteration count to stay ﬁxed at 1 if the user was creating a new render transactiona inside the render loop. Bright moon-shaped artifacts when rendering with the caustic sampler have been ﬁxed. Very large texture coordinate values are now handled properly. A bug causing ground shadows to be visible also on the lower side of the ground plane has been ﬁxed. A bug causing bright spots to spread over the image when using irt indirect light mode==2 and glossy materials has been ﬁxed. Rendering stopped immediately with progressive rendering max time==-1. This has been ﬁxed. A bug has been ﬁxed that caused ﬁreﬂy ﬁltering to be disabled with the tonemapper parameter setting burn highlights==0. Missing contributions from internal reﬂections for specular reﬂection light path expression have been ﬁxed. A bug when multiple objects were added at once after a scene was already loaded has been ﬁxed. Broken normals after transforming an object have been ﬁxed. Missing glossy contributions in light path expressions have been ﬁxed. The reachability analysis in the MDL core compiler for case statements without child statement has been ﬁxed. The compiler erroneously assumed, that the default case has a reachable exit, hence code after the switch is not dead. When base::blend color layers() was used in a jitted expression, the modes color layer hue and color layer saturation failed. This has been ﬁxed. where the compiler complains that a T array cannot be transformed into a uniform T array. The Reference Guide is also in the process of being populated/updated—updates will be posted over the course of the beta. I need to add this beta folder to excption (ignore ?) list of avast, otherwise ds dos not start. While there was no problem before update, may be caused by updating Windows 10 few days ago. I don't see anything there for 3delight. Is there any news, or updates, or chatter around the water cooler? Or is it just Iray updates so far? Pleas tell me y'all are working on something with the Daz Default shader, and this is a mistake. Not to double up Posts, however it's an issue in 4.9.0.36 as well. Studio 4.8 3DL spot render above. Updated 4.9.0.36 spotrender below using 3DL. After updated through DIM, this beta program does not start. The installed file size of DAZStudio.exe (DS Beta) is 68kb, and for DS 4.8 is 395kb. Is this right size? I'm using Windows 10 Pro 64bit v1511, Mem: 32 GB. Here, everything's fine. Exe size is 63Kb. Windows 10 build 9200. It was caused by Avast. (I edited my post). The new sort options in the Smart Content Tab now make it possible to sort all products like before in the DIM. Especially the option "Sort by Order Date: Recent First" allowed me to quickly install all the products of recent orders that I had not yet installed. with CTRL or mouse selections. A very cool feature I just discoverd is the ability to right click on any product and select "More Information". Inside DAZ Studio a new window with all the product wiki information opens. While browsing through not installed products this feature helped me to refreshen the memory what kind of product it is if I do not rembember by just the product preview image. - When the "ALL" subtab is open in smart content and "Sort by Order Date: Recent First" is selected on top of the list it seems instead of displaying all items of the last orders only the installed products of the last orders are displayed on top. You then have to scroll down trough all allready installed products to find those items of your last orders that have not yet been installed. This behavior confused me at first. I expected to see "ALL" products of my last order no matter if they are installed or not next to each other at the top of the sorted list. Other sorting selections seem to behave in a similar way. For example when selecting "Sort by Name: A-Z" in the All tab on top first all the installed products are sorted from A-Z and then below you find all the not installed products from A-Z. If there is not an option to choose it may add more value to have installed and uninstalled products displayed directly next to each other in the ALL tab based on the selected sorting criteria. If users want to have a look at installed and uninstalled products separately they can allready use the "Installed" or "Available" subtabs. Especially when installing a large selection of content having some kind of time estimate would help to deceide if one should make a quick visit to the kitchen or rather go for a shopping trip to the store while the content downloads and installs. In any case I can just recommend everyone to freshly install the DAZ Studio BETA on a second device to try out how easy and comfortable it now is to install your products directly inside DAZ Studio! A few months ago I was completly overwhelmed because there was no way to have a look at installed and uninstalled content at the same time. Now it is very comfortable and quick to select a category like "wardrobe:shirt" and then have all kind of shirts displayed no matter if they are installed or not or from which generation of figures they are. It is fun to rediscover some "old" products that way that were not installed yet to save harddisk space. About Auto-fit items which saved as scene in another version, seems lost all weight map. at current beta. Keep stability about saved scene, is far more important than new file serching , or install system for many user. Seems to be more of an improvement than previous betas; so I have my issues with 4.9, the rendering speed improvement, however, is a welcome addition. I'm not interested in the Daz connect and don't use it; I've reverted to my old method of finding and catagorising. I'm not so far seeing any issues with general use. used the cheerleader shoes on a genesis 3 figure; the scene for 4.8 is fine; the scene for 4.9 isn't. All I've done is load a scene from 4.8 in and the shoes are parented but at default location. I've tried unparenting them, and parrenting, fitting to and fitting to none, etc. I had to re add them to scene to get them to work. I have a look at those areas of the BETA that are of interest to me and provide feedback about them. This also means I will simply ignore other areas and not do any testing with them. I will not test how rendering inside DAZ Studio works because I still plan to use 3rd party render engines that will be shared by other applications I use like Zbrush or AfterEffects etc. So if you are interested in specific areas that are not discussed at all or less frequent just pick up the beta and try what works for you. So you can be sure that those things that matter to you are working. I don't know how anyone else feels about the fact that we can no longer remove references to POSER only content from the Smart Content information. I find it very anoying! Why does the meta data content have to be tired to the encrypted files? This is a major pain in the 'you know what'. If I am missing some thing here, then please let me know, but I don't want to see duplicate and sometimes triplicate instances of the same material when only one of them works in DS and the others are intended for POSER or POSER SSS, they are useless to me and clutter up the smart content. I see different pricing inside DS vs web Store. and I deeply believe your view and proposal to improve daz connect, and smart contents. But at same time, I think, daz need to care more, about stability even though it is beta. these auto-fitted item problems are expected easy, I think. Update on the autofit issue I reported above. I saved the scene, in 4.9 beta and it loads in 4.8 and the shoe is correctly placed. So I loaded a scene saved in 4.9 in 4.8 - no issues, reeopening that scene in 4.9 and the same problem occured. Since I installed version 4.9.0.36 there seems to be a very major issue with older hair props converted to Iray. They look fine when they have been fitted to a figure and converted but when the figure is reopened the hair has become a grey symetical object that doesn't even have any surfaces. Ths only seems to apply to as an example to V4 Hair fitted to G3F/V7 figures using the 'Auto Fit' panel. If the hair (Cr) is loaed and the Auto Fit panel dismissed or Fit to - None is selected, manualy fitted therafter then it's ok - but whats the point of the Auto-Fit if it no longer functions properely! Is there a specifc reason why the 'Filter by Content' flag doesn't work the same way in both the Files and Products sub-tabs of the Smart Content? I will use 'Valkynne Hair Pak' as an example of this problem. I have taken the time to correct all of the categories that were missing from the DAZ supplied meta data so all of the files in the product now have the correct (based on the DAZ Defaults) categoriy assignment. I reported PC+ discounts not showing in the last beta thread too so it's not just one user. - The CMS was installed properly and is working fine for 4.8. - The Anti-Virus hasn't changed between this update and the previous version of 4.9, which worked fine just minutes prior to download of the new version. 4.9 and 4.8 were both closed durin the installation. So it seems the new beta (4.9.0.36) has fixed the issue with not importing/showing products that start with "The", etc., so I've been testing the smart content some more. I've reset the database and reimported multiple times, testing the process and how well 4.9 imports (this beta is much faster than the reset/reimport of 4.8!!!). The one thing I did notice is that in resetting the DB in 4.9 then reimporting, it doesn't do a good job of indicating where it is in the reimport process--it goes to 100% within the first few seconds, then just hangs there, nothing in the history screen, until it finishes importing. 4.8 actually tracked the process, incrementing through the % as it imported the products--and showing them in the history screen so you had a pretty good idea of where it was in the process of importing. In the next process, I tested my usually workflow of updating products--I do this through the Content Database Editor. I'm running into a weird issue now when I edit a product in the Content Database Editor. Whether I make a change to the asset category path or asset type, once I save it, the product goes blank, none of the assets show in the preview pane and the changed assets don't show in the Categories--the path is created but the asset doesn't show in the category. If I reopen the product in the Content Database Editor, all the assets are missing in the asset tab. And, if I save it when it is in that state of all the assets missing, it wipes all of the assets out of the product in the metadata file. The only way to fix the missing assets is to reimport the metadata file immediately after each save of the file, but then on the next edit of the product in the CDE, it starts the whole process again--wiping out the assets in the product. 4.8 still works fine with editing through CDE, but as I make my edits in the CDE and sync the product and local database so my changes are saved to the actual metadata file (with +8500 products, the user data option usually doesn't work very well or gets easily corrupted), this CDE issue with 4.9 is problematic. Hopefully this issue will be fixed in a beta coming soon?